“The course was helpful, especially the fact that I had to dedicate at least that much time for preparation for the exams”. “I received my result notification today; I passed! I’m thankful for the good work you and your staff including the instructors did. It’s made a difference”. “I passed with a score of 83. I took the PE Mechanical with Thermal Fluids as the PM session. The course prepared me well as it has been 22 years since I received my degree”. “I would like to thank Test Masters again for the preparation and guidance that I needed to pass the FE & PE exam”. I made a passing grade and took the fluids and thermal depth. 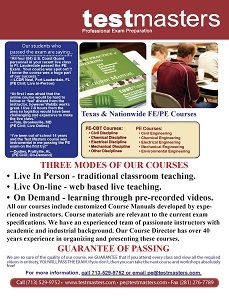 The course notes and information were used extensively during the test and were a big help. I believe the Testmasters course was a huge factor in my passing of this test and would recommend this course to anyone taking the PE exam. I would not have passed the exam without this course. Thanks. Test Masters was awesome, yall are the reason I passed. Thanks very much for the Testmasters service. I attribute much of the success of this past October to the preparation and strategic planning provided by Testmasters. Thank you very much for providing a solid course that helped reinforce my foundation of knowledge which helped me successfully pass my PE test. Your way of teaching was awesome. I’m sure as I enjoyed your classes, other students should have also enjoyed it. Your hand outs are also helping me in doing my job efficiently. “I am very grateful for your help and your support. It was my first time I took the PE exam. Your classes were very subject oriented, and the problems were well chosen.